The artists of the Nunavut community of Kinngait (Cape Dorset) have produced print art and carvings for over half a century, garnering worldwide recognition. 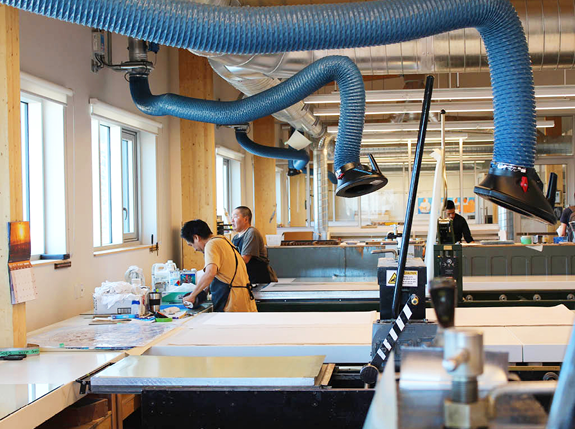 The WBEC artist co–op was in search of a new facility for its print shop for the production, promotion and sale of Inuit art and the hamlet was looking to create a cultural centre. The project includes modern print–making facilities, a drawing studio, and a cultural hub with exhibition and retail space open to residents and visitors alike. Arriving from the airport, the building appears colourful, uplifting and playful; vividly expressing the nature of the activities inside. A large scale exterior screen of coloured metal cut–outs created by local artists reflects the artistic and cultural mission of the project, marks the Centre’s presence from many vantage points, and emphasizes its important role for the local community. Panaq has been working closely with the community, designing the project, providing project management services and actively participating in the successful public and private fundraising efforts. “It’s not just for the community of Cape Dorset. It’s going to be very important for visitors that come from around the world, who come to Cape Dorset to see, meet the artists”.